Leonardo da Vinci was a great artist and scientist. We say this here because we totally agree with his assessment that amethyst is able to dissipate evil thoughts and quicken the intelligence. 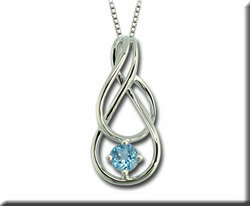 After all, wouldnâ€™t anyone look smart wearing our beautiful Sterling Silver Amethyst Pendant? We think so! 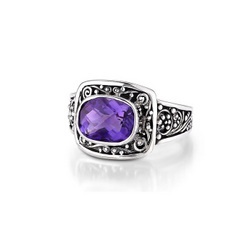 And who could look at our beautiful Sara Blaine Amethyst Ring and think any evil thoughts? With its gorgeous deep purple stone and royal setting, it just may make whoever wears it feel like a benevolent queen. Kings and Queens have long had a love affair with amethyst. It was, after all, Catherine the Great who sent an expedition to the Ural mines in search of the best quality of amethyst. And Catherine wasnâ€™t the only royal lover of amethyst. Amethysts are featured in the British Crown Jewels and are said to have been a favorite of Egyptian pharaohs. Royalty arenâ€™t the only ones throughout history to love amethyst, though. Amethyst has also been associated with churches, in particular the Catholic Church. Bishops often wore amethyst rings to symbolize piety and celibacy. People wishing to avoid drunkenness would decorate their goblets with amethyst as it was thought to be a cure for inebriation. We believe, though, that anyone would feel drunk gazing on these deep, wine-colored gems. You say you want to know more about these mysterious, regal stones? We hear and obey, your majesty! Amethysts are actually clear quartz with impurities of iron that have been exposed to irradiation. Light makes some varieties of amethyst fade, but heat can deepen and intensify that gorgeous violet color. Most amethysts available today have been heat treated and will not fade over time. Amethysts must be purple, but have a range of shades from light lilacs to dark purples and mauves. The highest quality amethyst has a deep medium purple color with flashes of rose. Although the best amethyst can be found in Siberia, Sri Lanka, Brazil and the far East, there are many places that boast amethyst mines in the United States. South Carolina loves amethyst so much that they named it their official state gemstone and examples of their amethysts can be seen at the Smithsonian Museum of Natural History. The largest amethyst mine in North America is located in Thunder Bay, Ontario. Amethyst, as you might know, is the birthstone for those born in February. Although lore claims that amethyst protects against drunkenness, including those drunk with love, we think that a birthday or Valentineâ€™s Day gift of amethyst could only make the receiver love you even more. You can come see us at 911 Old Liverpool Road, Liverpool, NY.